Earth orbits the Sun at sixty-six thousand miles per hour needing 365¼ days to notch a round trip. The Earth & planets orbit the Sun in an elliptical path. to 1500 Geocentric The astronomical system of many civilizations, including ancient Greece, held that the Sun, Moon, stars, and planets circled Earth. Aristotle's cosmological treatise On the Heavens, recorded in 350 BC, and Claudius Ptolemy's astronomical treatise Almagest, recorded in 150 AD, consider a stationary Earth as center of the universe. 16th C Heliocentric The Copernican Revolution held that Earth and planets follow circular orbits around the Sun. Nicolaus Copernicus published On the Revolutions of the Heavenly Spheres in 1543. Copernicus provided the seminal work of Renaissance astronomy that describes the paradigm-shifting heliocentric model. orbits Earth, a small body, orbits the Sun, a large body following an elliptical path, with the Sun located at one of the foci of an ellipse. Johannes Kepler improved on Copernicus's heliocentric theory. Kepler's first law of planetary motion (published between 1609 and 1619) describes the elliptical path of planets traveling at variable speeds around the Sun. Knowledge falters when imagination clips its wings or fears to use them. Every great advance in science has issued from a new audacity of imagination. Kepler's elliptical orbit is our current conceptual model. Planets orbit the Sun on an elliptical path with the Sun located at one foci of the ellipse. 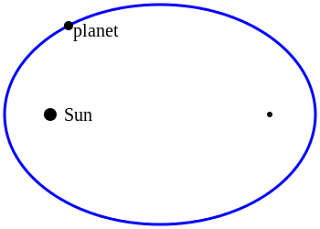 The Sun shown as the foci of the elliptical orbit of a planet. Reflecting on Copernicus's paradigm-shattering hypothesis in The Quest for Certainty, John Dewey cautions us against inflexible beliefs and urges us to beware obstructions to advancing our worldview. It has to search out and disclose the obstructions; to criticize the habits of mind which stand in the way; to focus reflection upon needs congruous to present life; to interpret the conclusions of science with respect to their consequences for our beliefs about purposes and values in all phases of life. The Quest for Certainty: A Study of the Relation of Knowledge and Action, John Dewey, Gifford Lectures 1929. London.